The PV7D are a all solid state design using the highest efficiency components. No heat sink is required on the PV7 because almost no heat that is generated in the high efficiency solid state components. We took great care to design the PV7D for long term unattended operation; extensive transient voltage protection; high steady state voltage protection (it is not affected by continuous charging input voltages up to 33V, the point where the transient voltage protection kicks in); fully sealed electronics for 100% humidity operation; etc... The PV7D is designed for Install and Forget operation. 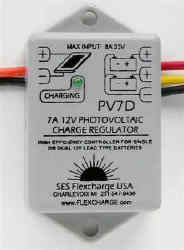 The PV7D includes an easy to read Charge Indicator. The peak charge voltage is factory set so there are no user adjustments to contend with working with all lead acid battery types. System wire connections are made by connecting to the controllers four wire pigtails, either by soldering or on a owner supplied terminal strip. Upgrading the controller to regulate many hundreds amperes can be accomplished easily and is relatively inexpensive. Contact Flexcharge for details. Cost Effective charge controller for Photovoltaic charging sources. Hermetically sealed / potted electronics for use in high humidity and salt air environments. High efficiency components allows packaging in a very small enclosure. All Solid State Design for extra long life and dependability. Factory Calibrated for charging lead acid Flooded cell, AGM, and GEL battery technologies. No user adjustments. Full 2 year repair or replacement warranty. Charging Indicator displays when the controller is passing charging current to the battery. Controller's circuitry eliminates back flow of current into solar panels during non charging periods. Parameter MIN. TYP. MAX. MIN. TYP. MAX. CASE SIZE H=1.25" W=1.5" L=3.0"